First day of Fall means we can finally start posting pumpkin things. Am I right? To be honest, I’m not even a huge pumpkin fan. I mean, of course, I like it. But I’m not rushing out to grab a pumpkin spice latte the first weekend of September. And, if we want to keep going, I opt for pecan or apple pie over pumpkin 10 out of 10 times. But there’s something magical about the arrival of pumpkin-everything. It means that there’s a slight chill in the air, that we’re back to sleeping with the windows open (<— my favorite thing about Fall), that chili is on the menu at least weekly and that I’ve completely lost BL to football on Sundays. 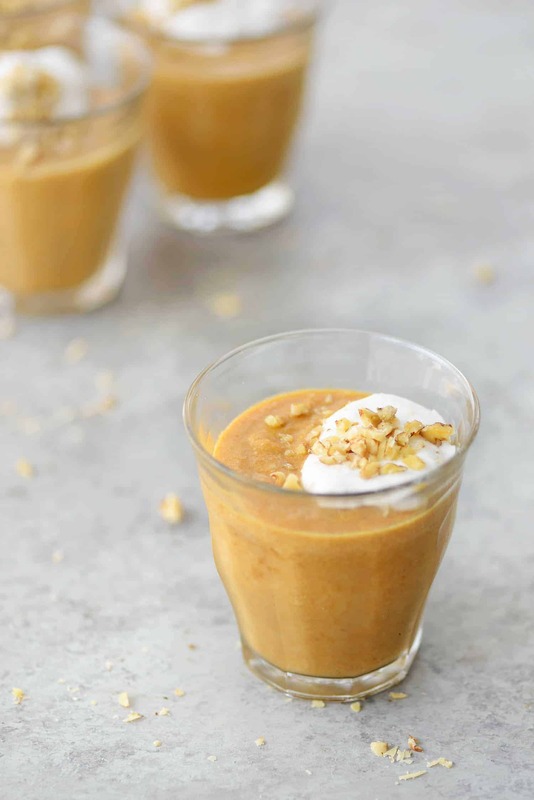 Pumpkin pudding cups! The perfect dessert when you are craving pumpkin pie, but not in the mood to actually make said pie. I was inspired for these cups a few weeks ago when my mom was visiting. We were talking about aquafaba (as all good food-obsessed mom and daughters do), and I couldn’t believe she hadn’t tried it yet. Talk about magic! You literally whip the liquid of canned chickpeas into meringue. It’s quite possible the coolest and weirdest food invention of the past few years. Obviously, I had to demo it for her. I planned on making my cherry chocolate mousse cups since they are the perfect intro recipe but thought better of it. If aquafaba can work with chocolate, it can work with pumpkin. I ended up making this a few times over the weekend, as I wasn’t super happy with the way the first two batches came out. I liked the aquafaba with pumpkin and spices, but it didn’t have enough body to it. It felt like pumpkin air. Delicious pumpkin air, but not the creamy richness that I associate with a pudding. So, we added in coconut cream. 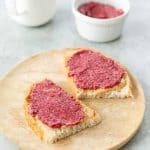 A secret weapon to 90% of my dairy-free desserts. Ok fine, I take it back, whipping coconut milk to whipped cream is neck-and-neck with aquafaba for coolest food tricks. To get coconut to act like you want it, you need to chill it first. It won’t whip the same from the pantry, so put it in the fridge overnight. Also, you need full-fat coconut milk or, preferably, coconut cream, for this to work properly. Again, don’t waste the money with light coconut milk. It won’t work. When you open the can of coconut milk, be very careful in grabbing just the solid part to place in the base of a stand mixer (or bowl with a hand-mixer). If too much of the liquid gets in, it won’t whip correctly. I know all of this sounds complicated, but I promise it’s not. Once you’ve made coconut cream once, it’s the easiest thing on the planet. Just a few things to keep in mind. I’ve also got a full primer here if you want more details. I think the easiest way to make this is to whip the coconut cream first, then remove and place in the fridge. Then make the aquafaba; fold in the pumpkin and then the coconut cream. 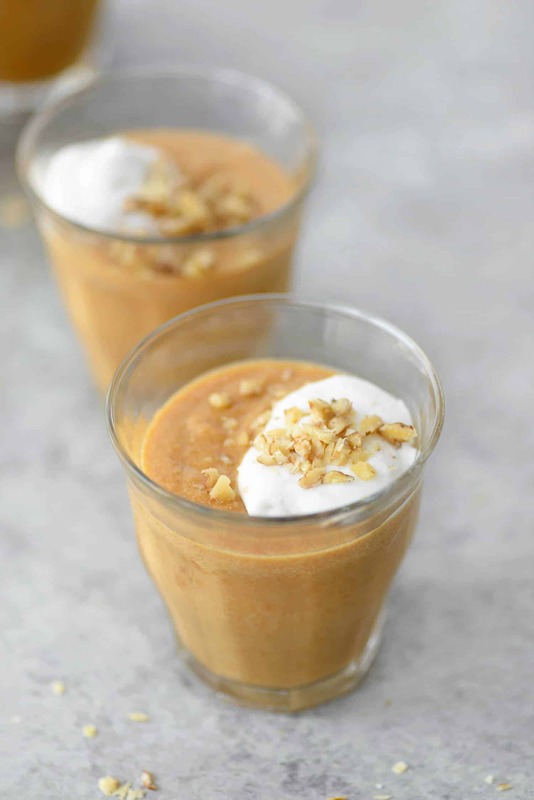 You’re then rewarded with a slightly-thickened, creamy pumpkin pudding. I saved a little of the coconut cream to dollop on top, followed by a sprinkle of walnuts. You don’t have to add either of these, but I think they give it a nice, finished touch. Either way. Happy first of Fall! Now go eat something pumpkin-y. 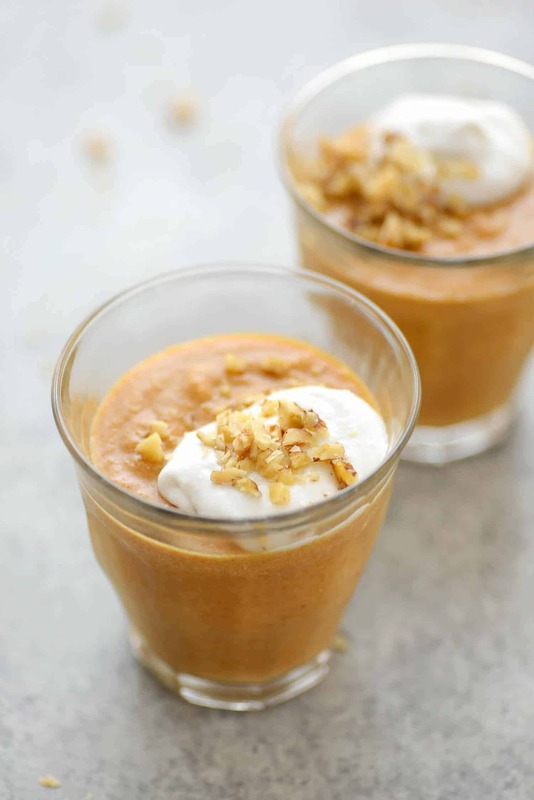 Vegan Pumpkin Pudding Cups! 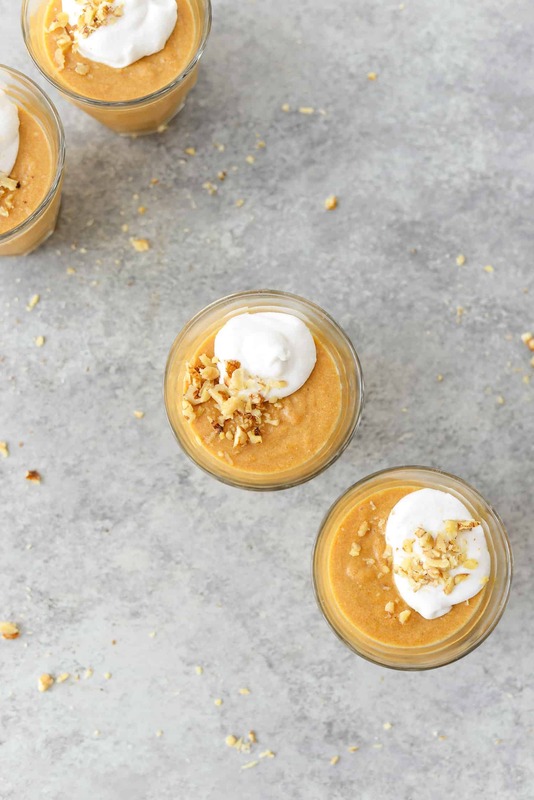 You’ve gotta try these pumpkin pudding cups made with aquafaba and coconut milk. 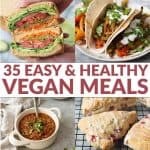 Vegan and Gluten-Free. Open the can of coconut milk, taking care not to shake. Gently remove the solidified pieces of coconut and place in the base of a stand-mixer. Take care not to get any liquid from the can into the base. If too much liquid gets in, the coconut won’t whip correctly. Whip on medium until creamy, like the texture of whipped cream. Remove and place in the fridge. Wipe out the base of the stand-mixer. 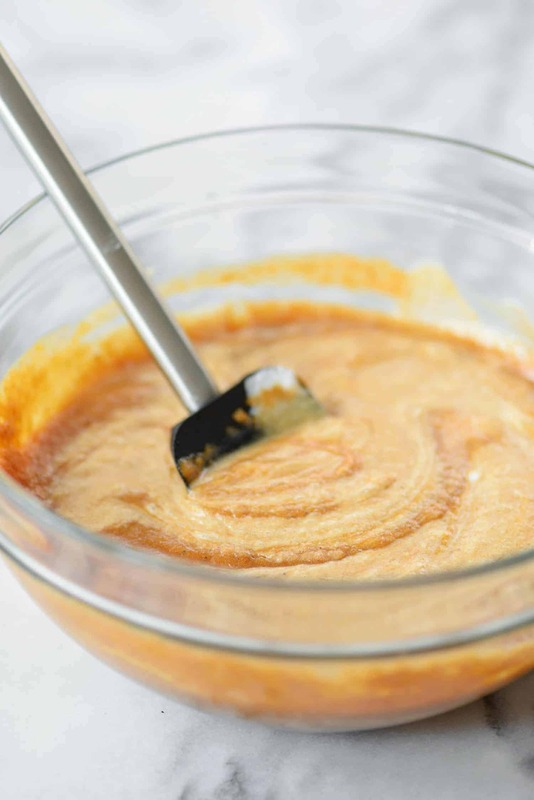 Place the 1/3 cup liquid from the can of chickpeas, powdered sugar and cream of tarter in the base of a stand mixer. Whip on medium until at least doubled in volume and able to hold stiff peaks, about 10-12 minutes. 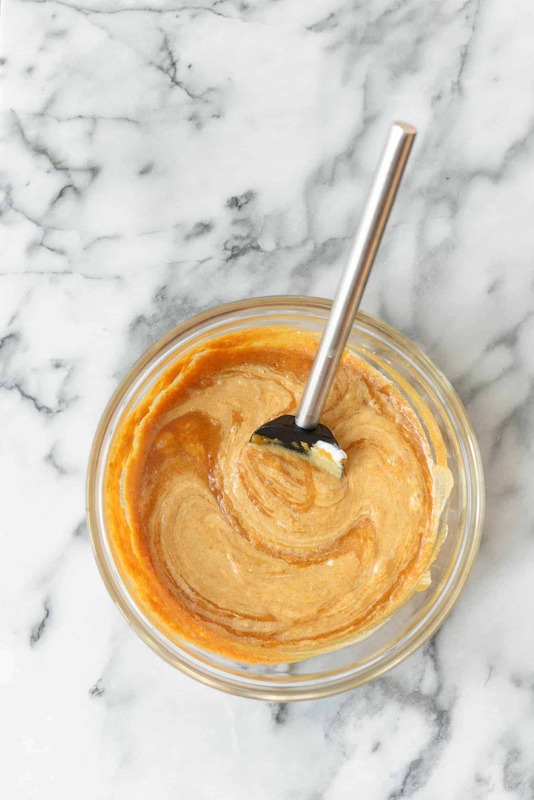 While the aquafaba whips, mix together the pumpkin puree, spice, maple syrup and vanilla until smooth. Once the aquafaba is done, slowly add in the pumpkin mixture and whip a few times until combined. Add in most of the coconut cream (saving a few tablespoons for topping at the end) and whip a few more times to just combine. Divide the mixture into 4 jars and top with a dollop of the reserved coconut cream. Place in the fridge for 1-2 hours until hardened. The coconut milk needs to be chilled before opening. If not, the solids and liquids won’t separate, you’ll need just the solids. If you get too much of the water, the coconut won’t whip together.